Single Incision Laparoscopic Surgery (SILS) can be performed entirely through the navel reducing patient trauma, recovery time, possibilities of infection, post-operative pain, and scaring. However, SILS is limited in its use due to design draw backs such as limited surgical tool motion and laparoscope positioning. The SILS specific camera system presented here is developed as a solution to these problems. The SILS camera device incorporates all the features of a laparoscopic vision system into a small, inexpensive, portable package that enables point-of-care applications and does not compete for space with the surgical tools (Figure 1). The device is inserted into a 12 mm incision in the umbilicus, followed by the SILS port. The camera remains separate from the SILS port, removing the need for a port dedicated to the laparoscope, thus allowing for an overall reduction in port size or the use of a third tool. Once inserted a spring deploys the camera system away from the incision site to rest against the abdominal wall. After being deployed in vivo, the camera at the distal end of the device can pan, tilt, and telescope (or extend) to provide an optimal view of the surgical site. The surgeon controls pan, tilt, and telescoping features through the use of a directional pad, mounted to the top proximal end of a surgical tool. An on-patient LCD display is located directly above the camera system providing an inline view of the surgical site. A SILS enabling camera prototype has been fabricated and is being used in an ex vivo participant study and in an in vivo porcine study. 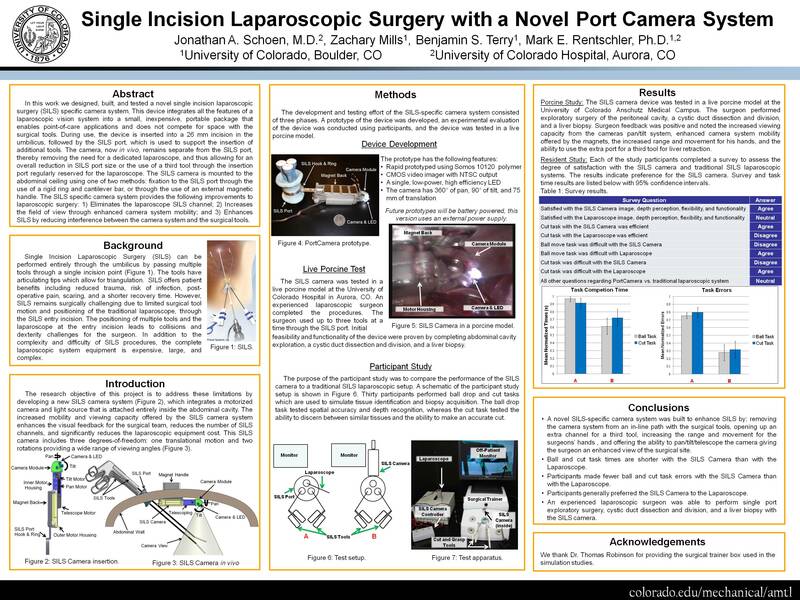 The participant study will evaluate the performance of the SILS camera device in comparison to a traditional SILS laparoscopic setup. Thirty participants will perform ball drop and cut tasks which are used to simulate tissue identification and biopsy acquisition. The ball and cut tasks simulate two of the most common basic procedures that laparoscopic surgeons perform, making the tasks useful in assessing the performance of a SILS system. The porcine study will evaluate the SILS camera performance against that of a typical SILS setup while performing a cholecystectomy. This SILS camera has been designed to transform SILS vision from a linear system in parallel with straight instruments all competing for operating space to a system which moves vision control and placement away from the tools while maintaining a clear view of the surgical site. The reduced SILS camera footprint allows for decreased invasiveness and added use of a third tool. This camera enhances SILS by: removing the camera system from an inline path with the surgical tools, increasing the range and movement for the surgeons’ hands; offering the ability to pan, tilt, and telescope the camera giving the surgeon an enhanced view of the surgical site; and significantly reduces surgical costs through the use of inexpensive camera and lighting components. Figure 1. SILS camera system in use.